Friday 26 Apr - Latest - Check the tables below for all the latest Furby Boom stock and price comparisons. We also track Furby Boom stock in-store at Argos to reserve and collect. See our Argos Furby Boom Store Stock Checker to see which shops currently have availability. Furby is back! The must have toy of the late 90's has returned is is ready to take the world by storm again. Having previously sold 40 million units, Hasbro have now significantly updated our furry friend for a generation more accustomed to tablets and smartphones. Based on the way you play with it over time it will develop it's own personality and range of emotions. Be nice to Furby by speaking, tickling, feeding and playing it music and you will witness your new adorable friend developing a sweet personality, but agravate it by pulling it's tail and shaking it and you may see a more mischievious side. 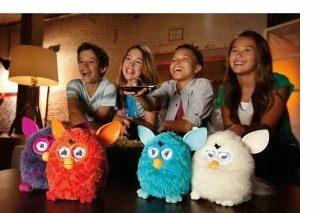 Straight out of the box, Furby will speak Furbish but the more you speak to it the more English it will start speaking back. Place one Furby next to another and they will start to interact having conversations in Furbish and dancing together. Furby has a mind of it's own, see what happens when you tickle its tummy, pat its head or pull its tail! It's also smart by remembering what it hears. 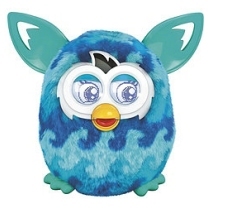 The original Furbies were famously banned from the United States National Security Agency due to concerns that they may be used to record and repeat classified information. Furby won't die if you don't feed it although it may go a bit nuts and with no off switch it's sure to drive parents crazy. However if you leave it alone for a while, it will drop off, start snoring and fall asleep. You can then wake it up with a little interaction. Via the Apple App Store, owners can download an optional free Furby App for the iPad, iPhone and iPod Touch (requires iOS 4.2 or later). This will enable you to virtually feed Furby and access a Furbish to English translator and dictionary to enhance your interactive experience. Initially available in six colours black, red, teal (blue), white, yellow and purple with four more colours expected later and comes with a recommended retail price of £59.99. Requires 4 x AA batteries which are not included. Suitable for ages 3 and over. We constantly check for Furby Boom stock, so you don't have to. 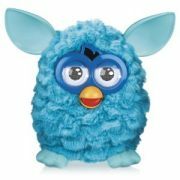 Receive email alerts when Furby Boom online stock is found.